The Kids Golf Clinic, sponsored by John Hancock, was once again the highlight of this year’s Expect Miracles Charity Golf Classic and grew three times in size from last year. The Kids Golf Clinic included recent cancer survivors and children who are currently in treatment. MFAC was honored to host fifteen incredible kids and their families for a day of fun on the course. The kids had a blast learning putting and driving skills from Golf Professionals and John Hancock volunteers. Lots of high-fives were given all-around and the excitement was palpable as the kids played like pros. 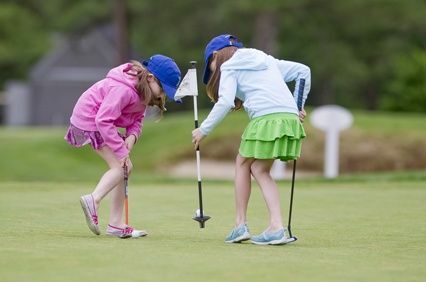 Soon enough, these young golfers will be playing right alongside our attendees! At the awards dinner, Kids Golf Clinic participant Andrew MacKinlay, a cancer survivor, gave a heartfelt speech about his journey with cancer and how difficult it can be, as kids just want to be kids. Tara Daniels from Bellingham, MA received the Guardian Angel Scholarship and will be attending Stonehill College in the fall of 2010. Diagnosed at Dana-Farber with Acute Lymphoblastic Leukemia (A.L.L. ), Tara is scheduled to finish treatment in January 2011. Each of these special kids was recognized before the audience by Founder and Chairman Frank Strauss and given an inspirational book entitled “Heroes for my Son.” To us, these kids are our heroes, and we wanted to share with them stories of others who have overcome challenged while accomplishing extraordinary things in their lifetime. These kids are an inspiration to all and it was a privilege to spend our day learning and laughing with them. Thank you Jordan, Kira, Tara, Andrew, Christopher, Jackie, Jenny, Katana, Harrison, Aleesha, Ryan, Brian, and Brenna for joining us!